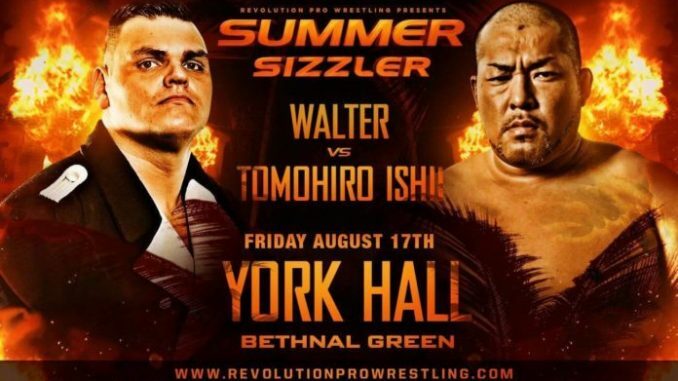 Results from Revolution Pro's Summer Sizzler card on Friday from York Hall, featuring a #1 contender's match for the British heavyweight championship between Tomohiro Ishii and Walter. This card was reshuffled mid-week after Davey Boy Smith Jr’s understandable decision to return home to his family. I really hope they have a better gimmick than this in mind for Oka after his excursion. A CCK reunion here due to the card reshuffle. This was over 24 minutes of insanity and both teams got a standing ovation after the match.